Allow us to welcome you to Dover in beautiful White Cliffs Country! You're in the only place that you'll find direct booking discounted rates - for affordable comfort & convenience in our AA 4 Star Silver Award Bed & Breakfast in Dover Kent, South East England. We have free forecourt parking, free Wi-Fi and quality bed & breakfast guest rooms for that quintessentially English (but with a modern twist) B&B experience - some with stunning views of the fabulous Dover Castle! Super double glazing ensures a good nights’ sleep! With morning luggage drop (by arrangement), free parking and free luggage storage until 4pm on departure day - we go out of our way to ensutre the very best is made of your stay! Location, location, location! 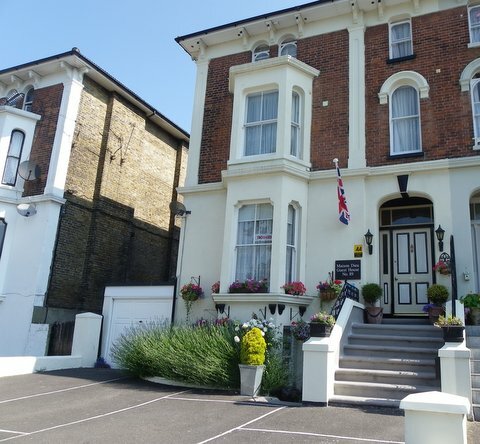 - for any bed & breakfast in Dover Kent England, location is absolutely key and we really are ideally located to offer a convenient bed and breakfast stopover enroute to and from Dover and mainland Europe. Dover DFDS & P&O ferry (for Calais and Dunkirk), Dover cruise terminals and The White Cliffs of Dover, England are just 5 minutes’ drive or 20 minutes’ walk. Channel Tunnel Eurotunnel England is 20 minutes’ drive. If travelling by National Express coach, bus or train, our Dover guest accommodation is just a few minutes level walk from stations, Dover Town Centre, Cineworld Multiplex, St James Retail Park, De Bradelie Wharf shops & restaurants. Beautiful White Cliffs Country, is criss-crossed with meandering coastal paths, stunning AONB and countryside walks including North Downs Way and England’s’ Coastal Path. English Heritage Dover Castle, Deal Castle & Walmer Castle & Gardens are within 10 to 20 mins drive, Canterbury with the stunning Canterbury Cathedral is just 20 mins drive or 30 mins bus or train. Yes, you really can be walking the White Cliffs of Dover within 30 minutes of arrival here - see White Cliffs Country for 'Events & What's On' in our area. Email info@maisondieu.co.uk or call 0044 (0)1304 204033 - hope to see you soon! Thinking of a holiday in White Cliffs Country? Why not contact me now about special rates for 7 nights bed and breakfast Dover, set in the heart of White Cliffs Country - rich in history, heritage and Areas of Outstanding Naturtal Beauty!